This is one of our most important pieces of advice. First off , big crowds make it tough to maneuver a stroller. Having a backpack allows you to take your kids as part of your person. You’re not worried about their safety because they are attached to you. Also, you can better weave in and out of large groups of people. If you have 2 small kids, get two backpacks: one for Mom and one for Dad. Second, popular travel destinations are often not very push chair friendly. There are usually lots of stairs (down to the subway or metro, perhaps). This increases the appeal of being able to take your kids on your back. The same principles are also true for outdoor destinations like hiking. It’s a simple but practical way to optimise the ease of transportation. 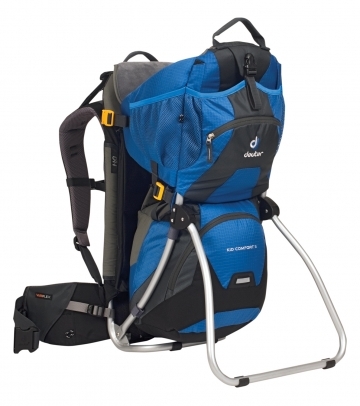 Our Top Pick: The Kid Comfort II by Deuter. This backpack goes for about $240 and is well worth it. You can pick it up in-store at someplace like R.E.I. or you can order on-line from Amazon.com or Amazon.co.uk. This bag beats out the competition for reasons of both design and comfort. The pack is adjustable according to your height and size. With both chest and hip straps, the weight of the child is better distributed on your body making it easier to cover more ground. The straps are well padded making the backpack quite comfortable. The kickstand makes it possible to take off the backpack and set in down without taking out your child every time you want to stop (a very convenient feature). There are also several pockets and pouches that can store items essential for traveling with kids. Things like diapers, wipes, snacks, toys, sunscreen, water bottles, etc. We would recommend picking up the sunshade for an extra $30. There are also kid comfort’s I and III but we’ve found that the II has more storage space than the small and is not as bulky as the large. Thus, it is our star pick in child carriers.